Bigelow Green Tea Classic Keurig K-Cups Pods 72ct. 4 Boxes each containing 18 k-cups 11/2020 exp date Fresh Stock. Free shipping is for the U.S.48 States only! ABOUT BIGELOW: FAMILY TEA BLENDERS SINCE 1945: For three generations, the Bigelow family has specialized in creating a variety of deliciously different teas. Using only the finest ingredients and secret family recipes ensures that each cup of Bigelow Tea is backed by over 65 years of family passion. For use with Keurig K-Cup brewing systems only. Compatible with all Keurig K-Cup brewing systems. Tea bags are individually wrapped. Trending at $22.45eBay determines this price through a machine learned model of the product's sale prices within the last 90 days. (THERE ARE 2 BOXES of GREEN TEA CLASSIC & OTHER BOX IS LEMON GINGER HERBAL TEA. FOR USE IN ALL KEURIG K CUP BREWERS. THE BEST BY DATES ARE: (((((((((((((((((( 2020 DATES ))))))))))))))))))))))))). THE 2 GREEN TEA CLASSIC BOXES WERE RIPPED OPEN AND IS NOW TAPED BACK CLOSED. 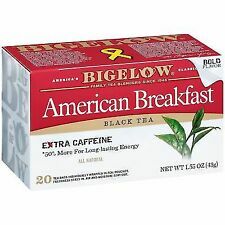 Bigelow American Breakfast Black Tea - 20 bags per pack -- 6 packs per case. Kick start your day with this stimulating blend. A blend crafted with the finest ingredients to create a beautiful cup of tea with a higher caffeine content. Its important to note the different lift you get from coffee and tea. Tea gets help from Theanine, a naturally occurring compound unique to tea. This in combination with caffeine gives you a sustained energy boost along with a feeling of relaxation and focus that only tea can provide. We invite you to sip a cup of our American Breakfast Tea; made in America, by an American family, for the American consumer. Bigelow Green Keurig Tea k-cups 24 Count. New Best By: 2/14/2020 FREE SHIPPING!!! Thanks for looking and please check out my other items. You will receive 6 boxes, 12 pods per box. 1 BOX SEPT 2019 or LATER. Keurig Brewed. 12 Cup Box. Product Details. Fair Trade Certified. Trending at $23.06eBay determines this price through a machine learned model of the product's sale prices within the last 90 days. Bigelow Single Flavor Tea Green 28 Bags/Box 00388 - Sold as 28/BX. One bag makes the perfect 8-oz. cup of tea. • One bag makes 8-oz. Excluded are Alaska, Hawaii, Puerto Rico, APO/FPO, PO Boxes and International locations. Bigelow Single Flavor Tea Cozy Chamomile 28 Bags/Box 00401 - Sold as 28/BX. One bag makes the perfect 8-oz. cup of tea. • One bag makes 8-oz. Excluded are Alaska, Hawaii, Puerto Rico, APO/FPO, PO Boxes and International locations. Individually foil wrapped. Bags are individually foil wrapped, helping to retain freshness. Excluded are Alaska, Hawaii, Puerto Rico, APO/FPO, PO Boxes and International locations. 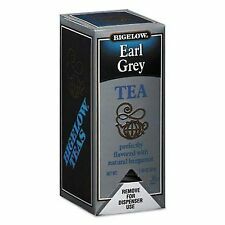 Bigelow Earl Grey Black Tea 28/Box 10348 - Sold as 28/BX. One bag makes the perfect 8-oz. cup of tea. • One bag makes 8-oz. Excluded are Alaska, Hawaii, Puerto Rico, APO/FPO, PO Boxes and International locations. Don't settle for boring teaBigelow® steep teas creatively blend exotic, on-trend ingredients in unexpected and uniquely flavorful ways. All natural, organic teas. Gentle tasting dandelion leaves blend with a delicate green tea and a sweet hint of peach, for a mild soothing flavor with earthy tones. An airtight lid and cup lock in freshness and flavor, while a filter inside ensures that the water will extract the optimal coffee or tea flavor. Because brewing takes place inside this 'mini-brewer,' there is no residue left in the brewer to taint the next brew. Taste the wonders of green tea. Rich, high-quality teas are the perfect choice for the office and tasteful enough for after-dinner party service. • Individually wrapped tea bags. Eight green teas to choose from. Bags are individually foil wrapped, helping to retain freshness. Excluded are Alaska, Hawaii, Puerto Rico, APO/FPO, PO Boxes and International locations. Bigelow Single Flavor Tea Premium Ceylon 100 Bags/Box 00351 - Sold as 100/BX. One bag makes the perfect 8-oz. cup of tea. • One bag makes 8-oz. Excluded are Alaska, Hawaii, Puerto Rico, APO/FPO, PO Boxes and International locations. Bigelow Green Tea Bags Foil Pouch 168/CT Apple Green 00388CT - Sold as 168/CT. Dont settle for boring teaBigelow steep teas creatively blend exotic, on-trend ingredients in unexpected and uniquely flavorful ways. All natural, organic teas. Gentle tasting dandelion leaves blend with a delicate green tea and a sweet hint of peach, for a mild soothing flavor with earthy tones. One bag makes the perfect 8-oz. cup of tea. UPC: 072310003569. Bigelow® Single Flavor Tea, Decaffeinated Black, 48 Bags/Box. Master Card. Don't settle for boring teaBigelow® steep teas creatively blend exotic, on-trend ingredients in unexpected and uniquely flavorful ways. All natural, organic teas. Natural chamomile, blended with a hint of lemon provides a sweet and soothing way to unwind; caffeine free herbal tea. Bigelow Single Flavor Tea Decaffeinated Black 48 Bags/Box 00356 - Sold as 48/BX. One bag makes the perfect 8-oz. cup of tea. • One bag makes 8-oz. Excluded are Alaska, Hawaii, Puerto Rico, APO/FPO, PO Boxes and International locations. Racks are beat up bit with rust and character. Missing rubber on one of the legs/stand. (Condition of item is used). An airtight lid and cup lock in freshness and flavor, while a filter inside ensures that the water will extract the optimal coffee or tea flavor. K-Cup perfect for Keurig Single Cup Brewers. 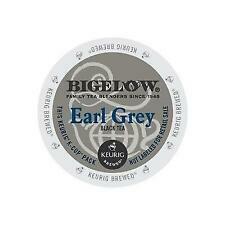 The satisfying, toasty notes of Bigelow Earl Grey Tea are what set it apart from all others. For_Use_With - Keurig Brewing System. Flavor:English Breakfast. Flavor - Breakfast Blend. Give us a shot and we will make sure that you will look to us again! Size:24 Count. Beverage_Type - Tea. You're already purchasing the item. A soothing cup of tea is perfect at any time of day. One bag makes the perfect 8-oz. cup of tea. Great for home and office. Beverage Type: Tea; Flavor: Green Tea; Packing Type: Bag; Quantity: 28 per box. 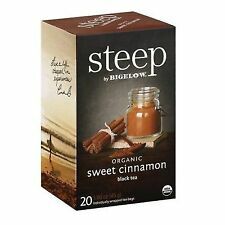 Don't settle for boring tea—Bigelow steep teas creatively blend exotic, on-trend ingredients in unexpected and uniquely flavorful ways. All natural, organic teas. Non GMO. Part of a fair trade, ethical tea partnership. Spicy ginger root and zesty citrus combine for a flavorful cup of caffeine free herbal tea. Beverage Type: Tea; Flavor: Lemon Ginger; Packing Type: Tea Bag; Capacity (Weight): 1.6 oz. 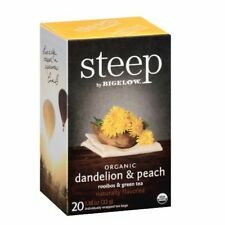 Don't settle for boring tea—Bigelow steep teas creatively blend exotic, on-trend ingredients in unexpected and uniquely flavorful ways. All natural, organic teas. Non GMO. Part of a fair trade, ethical tea partnership. Natural chamomile, blended with a hint of lemon provides a sweet and soothing way to unwind; caffeine free herbal tea. Beverage Type: Tea; Flavor: Chamomile Citrus Herbal; Packing Type: Tea Bag; Capacity (Weight): 1 oz. Floor Finish Certo 20 Wet Look. Hand Soap Foam GOJO #5665 1.2L 2/cs. You might also like. Excellent flavor that's never grassy or astringent. Delicate rich flavor sets it apart from all others. Floor Finish Certo 20 Wet Look. Hand Soap Foam GOJO #5665 1.2L 2/cs. Buy now and save! You might also like. All-natural teas from the finest high elevation gardens that have been gently processed to produce a high quality green tea. Excellent flavor that's never grassy or astringent. Delicate rich flavor sets it apart from all others. Convenient K-Cups work with Keurig brewers. 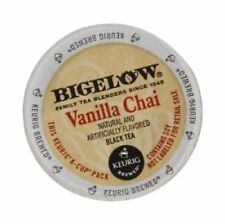 Beverage Type: Tea; Flavor: Green Tea; Packing Type: K-Cup; For Use With: Keurig Brewing System. One bag makes the perfect 8-oz. cup of tea. Beverage Type:Decaffeinated Black Tea. Flavor:Decaffeinated Black. Global Product Type:Beverages-Decaffeinated Tea Bag. We focus on making purchasing online a pleasant experience. 48 Count K-Cup Bigelow 'ENGLISH BREAKFAST BLACK TEA' - FRESH!! New Stock! !